Rue Erlanger is a residential street close to the Parc des Princes soccer stadium. 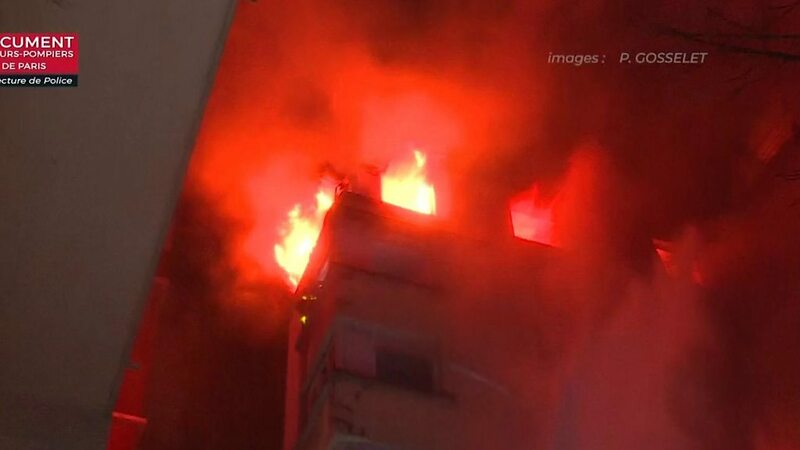 The fire started on the second floor and spread across the 1970s building on Erlanger street shortly after 01:00 (00:00 GMT), forcing some residents to scramble on to nearby rooftops to escape the flames and smoke. Firefighters said the building’s courtyard acted as a funnel, helping the flames to spread from the lower to the upper floors. Paris Prosecutor Rémy Heitz said the suspect was known to psychiatric services. Paris Mayor Anne Hidalgo has sent her condolences to the victims, and is on her way to the site, along with Interior Minister Christophe Castaner. By mid-morning the fire had been extinguished and normal life was resuming. Sounds of children playing came from a schoolyard next door. The building is on an inner courtyard, so from outside there was no sign at all of the anguish and the drama. But groups of people were milling about, residents from neighbouring buildings who have been told to leave their homes. They wanted to know when they could go back. The occasional witness arrived who saw it all: the screaming, the flames, the people on seventh-floor window ledges staring into the void. They said they wouldn’t ever forget.